Part three of a five-part series I am doing this week as I look back at the making of Slayer’s Still Reigning DVD. From load in to load out, I was there with the band. Hatebreed and God Forbid had gotten the crowd warmed up, now it was Slipknot’s turn. Doors had opened a bit late due to the last minute set-up of the blood-rain system, but at least it was complete and ready to go. Whether it was going to really work the way everyone was hoping for was another question. I photographed a couple of songs during Slipknot’s opening set. If anyone could hold their own as an opener for Slayer, it’s definitely Slipknot. 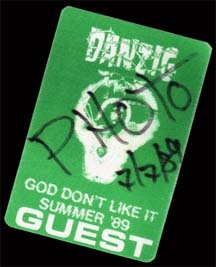 When I finished shooting, I headed back to Slayer’s dressing room to hang with them until they went on. Just before I left the arena floor, I took a good look at the crowd, the venue was oversold, and there was hardly room to stand. Everyone was feeling the excitement of what was soon coming. 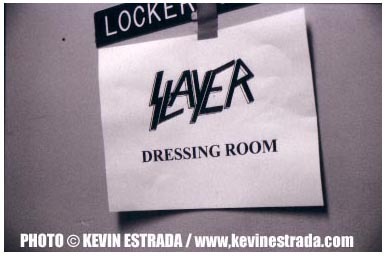 The mood in Slayer’s dressing room was surprisingly calm and quiet, but there was still a sense of tension and unspoken worry. I sat alone with Kerry King for quite some time as he strategically whipped up a super-solid set list…saving entire Reign In Blood album as the encore. Kerry put a lot of thought and a lot of heart into this set list. He wanted to make sure that the first half of Slayer’s show was as strong as possible. Slayer has such a huge archive of songs, it was very difficult for Kerry to pick and choose what made it into the set that night. 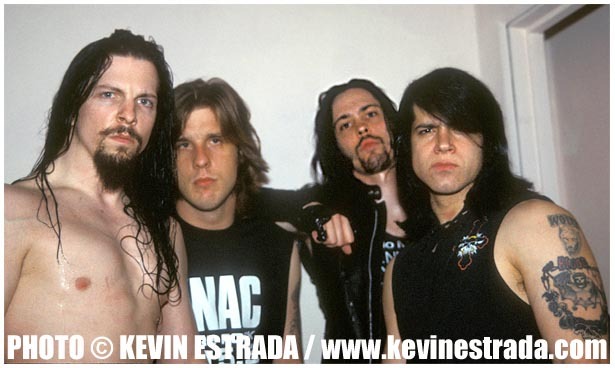 Then, as soon as Kerry King laced up his Armband Of Nails, much like medication as it kicks in and starts to take effect, the band kicked into overdrive and became the Slayer that we all know. Right in front of me, Jeff and Kerry started jamming together, at full speed. It was amazing, it was like they were onstage and I was the audience. No amps, nothing, just them, their guitars and myself. I didn’t want that moment to end, it was incredible. Dave was violently banging away with his drumsticks on a locker door. Tom seemed to meditate as he sat alone, his mind seemed to be racing in a thousand directions…he was ready. Stop by tomorrow and every day this week as we get closer and closer to Slayer hitting the stage in my weeklong retrospect of Slayer’s Still Reigning DVD.